Chicago is a city CHOCK-FUL of amazing stuff to do year-round! If you're looking for the hottest local events, concerts, festivals, look no further than this page! We've got the 411 on all the cool stuff to do that you'll need - There are even direct links to book, ticket, or buy! Welcome to ACME and to our awesome city! Nothing beats the classics. Get a true taste of Chicago at world-famous sights like the Willis Tower, Navy Pier or Lincoln Park Zoo. Get the skinny on the city's best music venues, performances and hotspots, and experience Chi-Town like a Chicago insider. Chicago is a sports town, no doubt about it . . . In summer and FALL, we've got the 2016 World Series Champion, CUBS - at the amazing Wrigley Field. Plus you can check out the notorious 3 B's - Chicago Bears, Blackhawks, and Bulls this fall and winter! 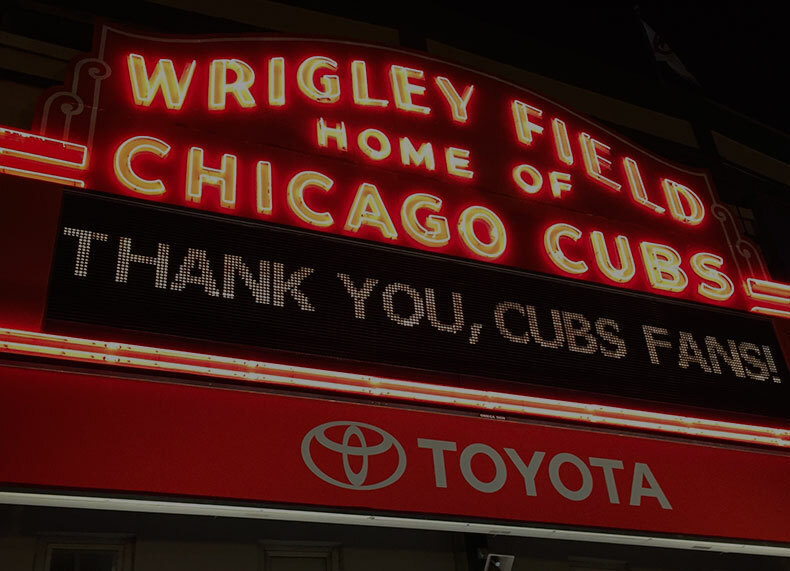 Check their schedules and plan to spend a few nights in the Chi - even if you don't score tickets - there's plenty of fist-bumping and high-fiving to be had on game days at like a gazillion sports pubs around the city. Bear down! Renowned photographer Laura Simmons' Exhibit Big Camera Little Camera stars at the Museum of Contemporary Art for a 3 month run. "Simmons creates fictional scenes that mirror and unsettle the American dream of prosperity and feminine domesticity". It will be worth a look, for sure. Chicago Cubs Home Opener. Do we really need to elaborate? Record Store Day returns, and if you love the vinyl, this day was meant for you! Record stores all over the city will be celebrating this groovy (get it?) day with events celebrating all things vinyl! Live DJ's, give-aways, bands . . . you name it! Get yourself to a record store and PLAY! If you think he's funny on TV, be sure to catch Trevor Noah live at his Loud and Clear Tour at United Center. He's only here one night, so grab your tickets fast! Or make friends with somebody that's got them! The annual Chicago Beer Classic returns to Soldier Field and it promises to be epic once again. Check it, Live music, BEER, and all your bff's all in one place celebrating with brews from every corner of the universe! If you want to see the hysterical side of high tech, check out the Nerd Comedy Fest at Stage 773. It's a brilliantly funny take on all things Nerd . . . and on a great stage to boot! Check out this Manifest, an all-day Urban Arts Festival hosted by Columbia College. Enjoy live performances, fashion shows, readings, and every medium of student art you can imagine - digital and otherwise. It's all in and around Columbia in the loop - - - so you can't miss it. It's the ultimate exhibit of one of the greatest impressionist artists of all time! Manet and Modern Beauty comes to the Art Institute of Chicago. Be sure not to miss this one! The summer music festival kicks off with the annual Chicago Gospel Festival. A huge draw every year, this Grant Park festival features some of the best Gospel talent in the world. Check it out! "Bang Bang, there goes my heart . . . and yours will go bang at the Ariana Grande Sweetener Tour. A multi-platinum artist with a voice bigger than her physical being, this promises to be an epic 2 nights at the United Center. If you've got the blues, or just love the blues, check out the Chicago Blues Festival at Grant Park. It's a crowd favorite every year . . . Amazing guitar riff anyone? Two of our favorite Art Festivals are back and promise to be full of fun, great art, live bands, food and music. Get to the Wells Street Art Festival, and while you're there, go next door to the Old Town Art Fair. On no other city street is there more art than these two. There both so good that we can never choose, so yup, we do both! Dead & Company hits Wrigley Field! We'll say it again. Dead & Company hits Wrigley Field. Rest up now. Bands will be announced soon for the biggest music event of the year, LollaPalooza! Stay tuned and start making your plans to get here! If you love the great outdoors, get yourself to the 606. An elevated jogging/hiking/biking path that takes you through some of the 312's most interesting neighborhoods like Bucktown, Wicker Park, Logan Square, and others. 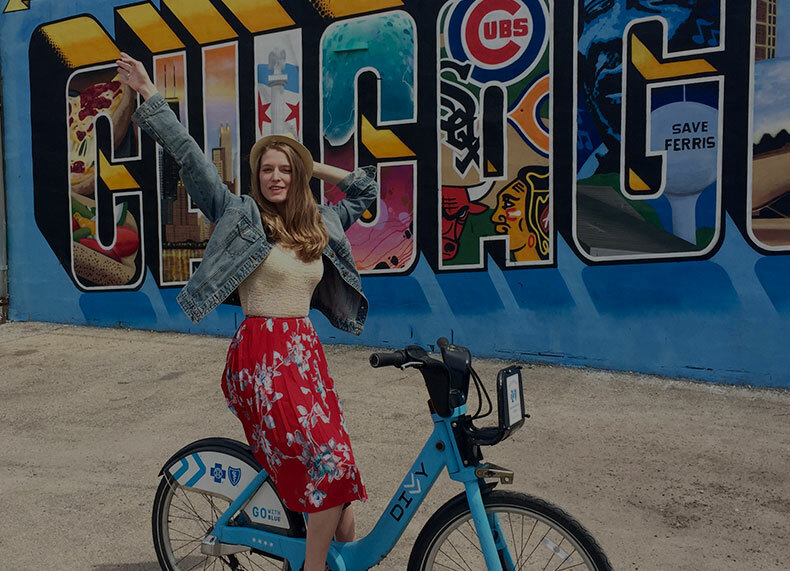 Bike your way through town on a Divvy. Those are the blue bikes you see pretty much everywhere . . . We suggest a ride up the Lakefront, coz it will net you some pretty awesome instagram shots! If you've been dying to check out EATALY, you're in luck - it's a block away, and yeah, it's awesome. It's a bustling Italian marketplace that offers some of the freshest fare and authentic Italian foods around. Foodies won't want to pass it up. In season, there are few things cooler than getting out on the cool waters of lake Michigan on your own (rented) jet ski, and worth e-v-e-r-y penny! Or one with the river in your very own kayak. Here you'll get some of the best views of the city, and get in a pretty decent workout too. Of course, both are seasonal. Check out the Riverwalk (hint: it's on the river), and check out the peeps walking and cruising by. It's a great stop for a cocktail, or just to brown bag it. What better way to hold on to a memory than with body ink? Deluxe Tattoo is one of the best tattoo shops in Chicago. We just recommend you visit sober - you know, no regrets and all. Everybody's heard about the Architectural Boat Tour, now go out and do it. It is def. one of the best "attractions" in Chicago. If you dig music, you've come to the right city. In addition to the major arena's, Chicago boasts a ton of awesome, more intimate venues that often book the cutting edge talent on the cusp of stardom. You may also see them at one of Chicago's major music festival during the summer. Here is a short list of some of the best venues in the 312 to sit back and jam. - These even made TimeOut Chicago's best list!